Update: You can read our review of the iPhone 7 where we address the real impact on losing the 3.5mm headphone jack. Does it mean you shouldn't buy the iPhone 7? Read our full verdict to find out. Apple has now officially unveiled the iPhone 7, and despite all the petitions, complaints and furious customers, the iPhone 7 and iPhone 7 Plus have arrived without a headphone jack. But while the decision is undoubtedly a source of controversy, there must be a reason for it. Here's why Apple decided to make this bold move. Schiller said on stage: "Some people have asked us why we would remove the analogue headphone jack. It's been with us a really long time and it comes down to one word: courage. Our team has tremendous courage." That's just marketing speech - which has already become a joke on social media - but Schiller's follow up offers more insight into why the iPhone 7 doesn't have a headphone jack. He said, "our smartphones are packed with technologies, faster processors...and all of it fights for space." That extra space, although minimal, is being used to pack extra tech into the iPhone 7. That's clear from the dimensions of the phone - the lack of a headphone jack hasn't made the iPhone 7 thinner, it's still 7.1mm like the iPhone 6S. You'll get a pair of Lightning EarPods in the box of the iPhone 7 and iPhone 7 Plus. These are much the same as the EarPods you've had in the box with previous iPhones, but they're designed for use with the Lightning port rather than a traditional 3.5mm jack. That means if you're reliant on headphones you won't be able to listen to music on your phone and charge it at the same time. Each phone will also ship with a Lightning to 3.5mm adaptor, so you can continue using your wired headphones with the handset. The adaptor doesn't look great, it gives you an extra cable to carry around, and it's going to be annoying when listening to music on the go. Plus, if you lose it, Apple will charge you $9 (£9, AU$12) for a replacement. 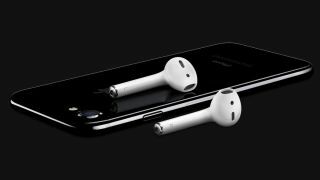 Apple is also releasing wireless headphones for you to buy alongside the iPhone 7 and iPhone 7 Plus, called AirPods. The AirPods are much like Apple's EarPods, but they're wireless and connect via Bluetooth. It may seem obvious, but you don't need to buy the AirPods to use the iPhone 7. We have seen some people on Twitter assuming you need to buy the AirPods alongside the iPhone, but instead you could use the EarPods from the box or your own wireless/Lightning jack headphones. Each of the Airpods has a touch sensitive back, so you can tap on the headphone to activate Siri and answer calls using the built-in microphone. You'll be keeping them in a small wireless charging case that Apple supplies, and once you flip the lid open your phone will recognize that the headphones are ready to use. That sounds pretty seamless, but the AirPods aren't cheap, costing $159 (£159, AU$229) and they also look rather easy to lose if not stored in the charging case. Not to mention the fact that they only offer around five hours of life on a single charge. Still, no-one said the future would be hassle-free, and if Apple makes good use of the extra space in its phones the port removal could one day be worth it.